This chart was first produced in 1902 at the request of the Windsor family. Work began updating the chart In the mid 1950's with the final product completed in 1977. The chart follows the progression from The House of David - The Royal Line; Zarah House of Troy; the Norse Lines; the House of Tudor; the Ancient British Line; the Guelph Line: the Byzantine Line and the Hungarian Line. The result is a very meticulous detailed account beginning with "Judah" and ending with "Queen Elizabeth II" as it traces her lineage back to King David. 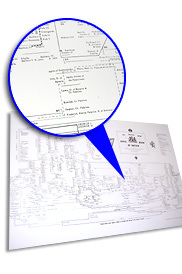 The Chart is 16"x26" in black & white and is printed on heavy quality paper which requires a Mailing Tube for shipping. Please Note: The $12.00 price includes Mailing Tube.